Geographical area: Panichishte is a beautiful resort in Rila Mountain – the highest mountain in Bulgaria. The drive from Sofia to Panichishte takes about 1,30 hrs. Being so close to Sofia, Panichishte is the perfect place to go for the weekend. How to get there: I recommend the following route because it is pretty and not too crowded: from Sofia take Bistrishko Shosse [Бистришко шосе] (the road to Bistritsa [БИСТРИЦА]). From there on, keep on the main road. You will pass Bistritsa [БИСТРИЦА], Zheleznitsa [ЖЕЛЕЗНИЦА], Yarema [Ярема] area (no sign for this one), Kovachevtsi village [КОВАЧЕВЦИ], Popovyane village [ПОПОВЯНЕ]. When you pass Popovyane [ПОПОВЯНЕ] you will come to a big T-shaped crossroads – go right. Then you will pass Klissura village [КЛИСУРА]. You will see Sapareva Banya [САПАРЕВА БАНЯ] village and town remaining on your left side. Turn left from the main road after you pass the sign pointing to Panichishte [ПАНИЧИЩЕ]. From there on, follow the signs to Panichishte [ПАНИЧИЩЕ]. There are signs for hotel Temenuga [ТЕМЕНУГА] once you reach Panichishte [ПАНИЧИЩЕ]. Here is a google map with directions but it is not very precise. Place to stay: Hotel Temenuga, definitely. The hotel: We were surprised to find such a cozy, small hotel high in the mountain. Temenuga hotel is really pleasant, clean and comfortable. In the middle of a small, trim meadow it has a beautiful view towards the scenic rocky tops and slopes of Rila Mountain. There are 19 double rooms and 3 appartments. There is a restaurant on the first floor and a lounge on the second floor, suitable for private parties. We celebrated a birthday party there. The rooms are large, clean and cozy with enough light getting in. Each room has a balcony with a wonderful mountain view. The bathroom is nice and clean with a bathtub. To my surprise there was even a hairdryer. Prices: the double room is 58 leva (low season) and 90 leva (high season) per night. The restaurant has a pleasant atmosphere – it is light and clean. The food is OK. Nothing special, but not bad. The breakfast is a block table and is included in the price. I am not a big fan of block tables so all I can say about the one they offer at Temenuga hotel is that it is as good as a block table can be. One drawback of the restaurant is bad ventilation system. In the menu they offer mostly food which is easy to prepare like salads, appetisers and BBQ meats. There is no big variety of what I call cooked meals (I always prefer a real cooked meal, one that takes at least 1 hour to prepare:) I recommend the chicken soup. Pros: beautiful mountain area, easy to get there, close to Sofia, very comfortable and cozy hotel, large rooms, wonderful view. Contacts: If you have questions about the area or Temenuga Hotel, use the contact form or just send me an e-mail at truebulgaria@gmail.com. Things to do: lots of mountain walks through the great pine trees. You can visit various mountain chalets: Skakavitsa, Lovna, Rila Lakes Chalet, Seven Lakes Chalet. And of course you have to see the famous and beautiful Seven Rila Lakes. There are a few small ski runs in Panichishte resort. The longest one is 950 m. and is in front of Rilski Ezera hut (in English – Rila Lakes hut, which is different from Seven Rila Lakes Hut). Panichishte is not the typical ski resort – the ski runs are short, there is no common infrastructure and the equipment is old. But this is only logical because Panichishte is a National Park Reserve, after all. It is not the place to come to if you are looking for a typical ski vacation. However, if you like free skiikng through the forest over virgin snow, you can do that starting from Rilski Ezera hut downwards. You can find more information about Panichishte and Rila National Park Reserve in the Panichishte Visitors’ Centre. 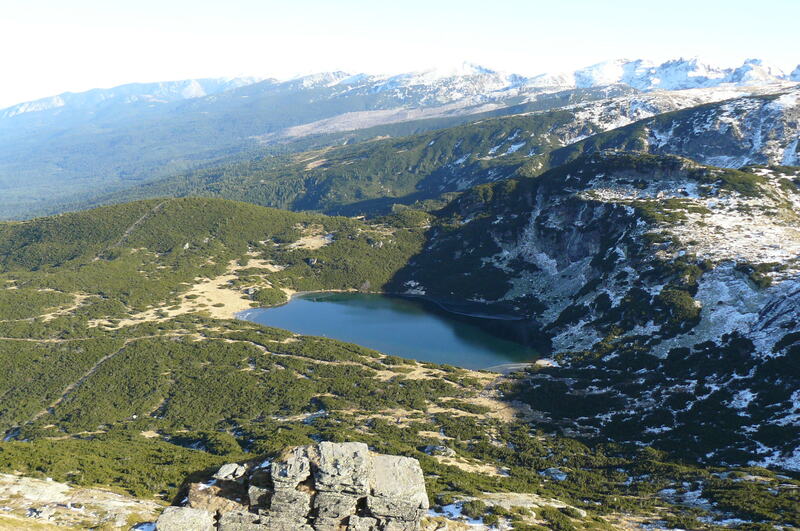 Also more information about Rila National Park here. Controversial eco issues: There is a newly operating lift from Pionerska hut to Rilski Ezera. The lift is said to be in controversy with the law. The public and the eco organisations are very much against the new lift. I do support their protests because Bulgaria has suffered enough from illegal over-building of many local resorts.